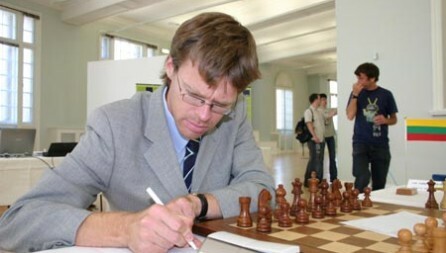 The Individual Chess Championship of Lithuania took place from 24th April to 1st May, 2014 in Vilnius, the capital of Lithuania. It was a 10 player round robin with an average ELO rating of 2388. GM Sarunas Sulskis is a deserved winner with 7,5/9 points, leaving the runner-up 1,5 point behind. GM Aloyzas Kveinys took clear second with 6/9 points, while IM Tomas Laurusas remained third with 5,5/9 points.